An antenna connection includes the coax cable and an antenna element. The TCAS computer checks the resistance of each antenna connection at power-up. 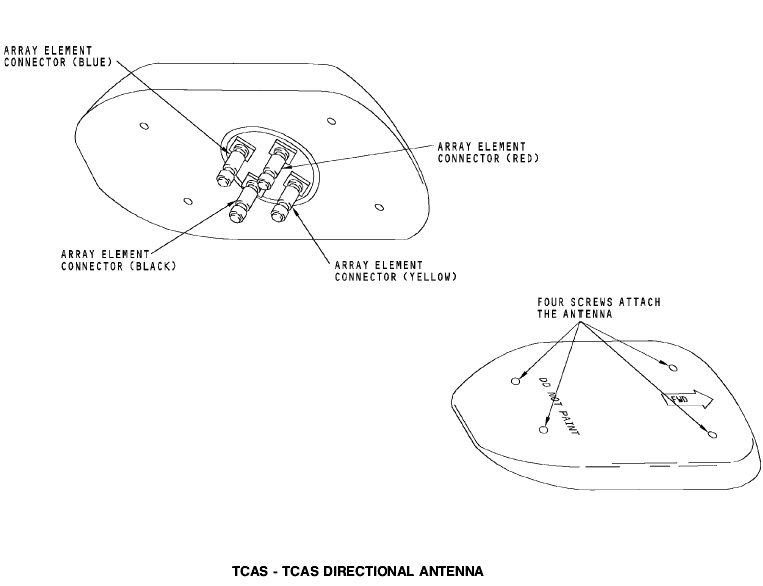 The TCAS computer reports an antenna fault when it detects that the resistance of the connection is out of range. If you do not connect the coax cable to the correct element, the TCAS computer reports an antenna fault. replies and data from other airplane systems to calculate if a target is a collision threat. The TCAS computer can communicate with other airplanes that have TCAS. The two TCAS computers can use the shared data to perform coordinated maneuvers and avoid potential collisions. The TCAS computer also gets analog and digital inputs from other airplane systems. These inputs control TCAS and provide data for TCAS to track intruders. The TCAS computer sends display data to the common display system (CDS) display electronic units (DEUs). · Air/ground data from the PSEU. · Intruders on ground disabled. The I/O circuits send this data to the CPU. The CPU sends the display data to the flight data acquisition unit (FDAU). It also sends signals through the speech processor circuits to the REU to make TCAS aurals. · Makes all signals necessary to receive and transmit mode S and ATCRBS interrogations through the receiver/transmitter circuits. The suppression circuit sends a suppression pulse when the TCAS computer transmits. The TCAS computer receives a suppression pulse when an onboard ATC transponder or DME interrogator system transmits. This suppression pulse stops the TCAS computer receiver and transmitter circuits. When there is a TA, RA, or during a self-test, the TCAS computer sends signals to the speech processor. The speech processor sends the aural alerts to the REU. The REU sends them to the flight compartment. During aural annunciations the GPWC sends an analog discrete to the TCAS computer to prevent TCAS advisories. During predictive windshear annunciations the weather radar sends an analog discrete to the TCAS computer to prevent TCAS advisories. The receiver gets the target replies from the antennas. The receiver uses the phase of the received signals to determine the bearing of the target. The receiver sends the signal to the signal processor to calculate the range to the target. The receiver decodes the target altitude from the reply signal. The receiver also receives and decodes coordination replies from targets equipped with TCAS. The transmitter has a 1030 MHz output. The transmitter gets signals from the signal processor. The transmitter sends the formatted signals to the beam steering and attenuator (ATT) circuits. The transmitter controls the beam steering circuits and whisper/shout attenuator.